Mesut Ozil has reportedly told his teammates that he will join the Red Devils at the end of this season. Currently at the end of his contract at Arsenal, it is being speculated that the talented midfielder will leave as a free agent, with Old Trafford as the potential destination. Looking at what Jose Mourinho did when he encountered the German back in 2013 might be a further indication of why he would want to join the ranks of United. 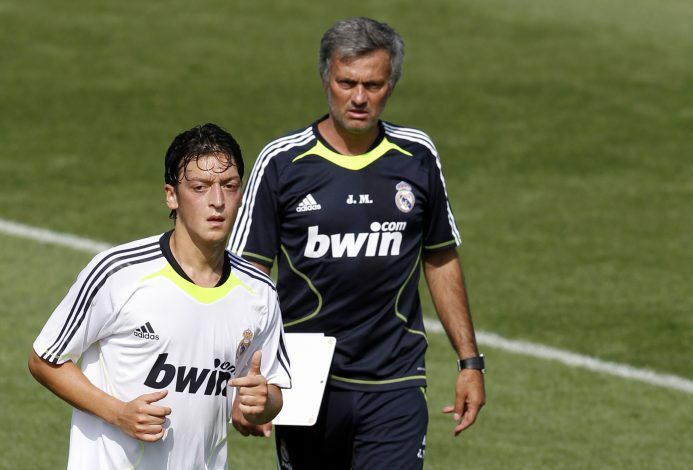 Back then, Mourinho managed Chelsea and Ozil had just signed for Arsenal. The two clubs clashed in the League Cup, where the Blues held the Gunners to a 2-0 defeat. After the match, Mourinho walked up to his former number 10 from his days with Real Madrid, and asked for his jersey. He went on to leave the pitch with the shirt in hand. This is an activity that usually only players indulge in, and the fact that Mourinho did the same goes on to show just how much he admires the 29-year-old. If that wasn’t enough of an indication, the illustrious boss had also written the foreword for Ozil in his autobiography. All of this hints at a brilliant rapport that is shared between the two. Fans will be eagerly hoping that the duo will be reunited at United. In fact, Ozil’s knack for providing quality assists might sit perfectly in the kind of team that Mourinho is slowly but surely cementing at the Mancunian club.